No food. No water. No sanitation. No safe place to go. No future. This is the reality on Manus. This week, our “aerial sit-in” has been one of many actions dramatizing this reality. The reality that if something is not done immediately, more men will die on Manus. So my prayer is that this article might be an altar call. My prayer is that as you read these words you may have your “come to Jesus” moment. I know that phrase is used as a metaphor, but my prayer is genuine. With everything in me, I pray that these words might bring us to Jesus. Which brings me to one more prayer — that you would take action for these men on Manus. This week. There simply is no more time. Why are you mixing Jesus and justice? Do you think living with refugees at First Home Project means you can’t see things objectively anymore? As an evangelist, why don’t you just stick to the “Sinner’s Prayer”? And now, before the altar call, here are a few of my answers. God’s Messiah and the messianic age of justice, peace, and joy in the Holy Spirit are inseparable (Romans 14:17). We cannot separate Christ, his cross, resurrection, and ascension from the coming of God’s kingdom. They are the coming of the kingdom. If your understanding of the curse is wider than your apprehension of God’s grace, we need to have a Bible study. Let me be clear, the gospel is good news to the captives on Manus. Rev. Dr. Geoff Broughton heard this objection to his leadership, “What are ministers of the gospel of Jesus Christ doing crossing-over into issues of human rights?” The answer is the gospel of Jesus Christ rights every wrong. Yes, living at First Home Project with refugees has unquestionably altered my perception, but this has only been part of my conversion. Living daily with people who spent four years on Manus means that more and more I see this through their eyes. Your neighbors interrupting the news stories from Manus to say, “That is Adam. He loves the Lord Jesus. Let us pray for him,” changes the way you watch the news. You could say I’ve had an interesting week. On Sunday I was praised in the newspapers for showing compassion to refugees, by Wednesday I was being slammed for asking for justice for refugees. I thought of the witness of Helder Camera as he said, “When I give food to the poor, they call me a saint. When I ask why the poor have no food, they call me a communist.” Discipleship of Jesus calls us to do both. And discipleship of Christ Jesus means we don’t have a neutral claim on the truth. As politically incorrect as it may be, our Lord says, “I am the way, the truth and the life”. (John 14:6) Truth for the baptized is not objective, it’s relational. A relationship with Jesus means we must be found where he is found, partying with who he partied with: the lost, the last, the least of these. 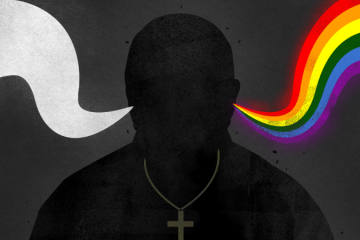 The persecuted church, who in part are found on Manus, offer us a way of seeing the world that calls us to conversion. We must live Christ’s way, proclaim him as the truth, and live his life. Yet I want you to hold me accountable, if I ever start “hitting and splitting” instead of “staying and praying,” please bring up that I’m not submitting to the authorities. The “Sinners’ Prayer” is not in the Bible. (Well, unless you are in a hotel room and pick up a Gideon’s Bible. God bless the Gideons.) Don’t get me wrong, I always give an opportunity to respond to the gospel, but any altar call must lead to believing, repenting, and being baptized (Matt. 28:19-20, Rom. 6:1-18, Acts 2:38-41, Acts 10:48, Acts 16:31-33, Acts 22:16, 1 Cor. 12:13, Col. 2:12, Gal. 3:27, Eph. 4:4-6… I could go on). I really think the church’s slowness to respond to the “least of these,” including our brothers on Manus, is a failure to take our baptism in Christ seriously. Let me explain, variations of the Sinner’s Prayer arose in the Great Awakenings. Evangelists were helping people make faith personal and (don’t miss this!) signing them up to a political campaign that was in keeping with gospel proclamation. I’m not making this up. Charles Finney, an innovator of the use of the Sinner’s Prayer was giving people the opportunity to make faith in Christ personal AND practical for “the least of these.” Finney was literally signing you up to end slavery when you came down the front. If you weren’t willing to sign up for the abolitionist movement, he would turn you away because you hadn’t put your faith in Jesus! And yes, refugees, as “strangers,” are explicitly mentioned in Matthew 25:35 as Christ in camouflage as the poor. Only in our hyper-individualistic culture(s) can the Sinners’ Prayer become a magic incantation to avoid hell rather than putting us on the journey toward baptism, being immersed in Christ, and God’s kingdom agenda. Finney was never replacing baptism with the Sinner’s Prayer, he was calling people back to it. The early Christians did not pray the Sinner’s Prayer as isolated individuals to become Christians. They prayed the Lord’s Prayer as communities in response to the grace of God. They responded to the gospel by becoming part of a people through the waters of baptism. More than just a personal prayer, baptism was a political changing of allegiances. Nationalism, patriotism, racism, class, violence, lust, and greed no longer name us. In baptism we were given a new name. We died to those powers, and were raised in the name of the Triune God (Matt. 28:19, Gal. 3:26-29) to walk as Jesus walked (1 John 2:6). We have Christians in Australia responding to those on Manus as Australians, when we need Australians who respond as Christians. Only then will we witness the redemption of the nations. Baptism is where the early church was immersed in the narrative of God’s liberating-love. They were immersed in the reality of repentance, forgiveness of sins, God’s community, and the seal of the Holy Spirit (Acts 2:38). For the early church, baptism was being birthed anew into God’s new world (Jn. 3:3-5, 1 Pet. 1:3, Titus 3:5). They died to their old self, formed in the patterns of the kingdoms of this world, and were raised with Christ into the nonviolent redemptive patterns of discipleship (Rom. 6:3-11, Col. 2:12). They didn’t merely invite Jesus into their heart as their “personal Lord and Savior” — they responded to Jesus’ invitation to God’s heart for all of creation. Baptism was not merely an outward sign of an inner reality; it was a personal appropriation of the outward coming of the Kingdom of God. They pledged allegiance to Christ as cosmic Lord and Savior of all creation (1 Peter 3:21). As evangelists, we are commissioned to call the world into a community that prays the Lord ’s Prayer and allows the Holy Spirit to move us into action. We are baptized into a community that witnesses to the kingdom coming on earth (Matt. 6:9-13). As the church, we must act to show that God’s kingdom wants to come to Manus. 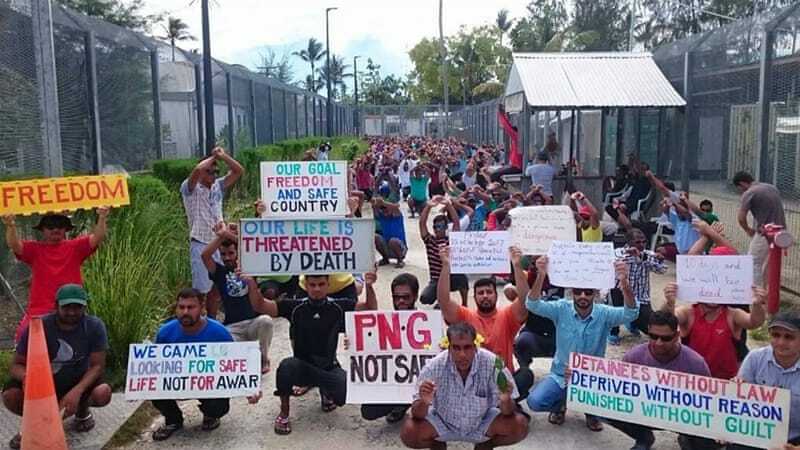 Do you accept Jesus’ invitation to God’s heart for the world, especially these men on Manus? Do you give your life to be baptized into Christ, dying to your old self, and rising with Christ? Will you take action this week with our brothers on Manus and join us in declaring that #LoveMakesAWay?